Enghlish theatre Protected content welcomes us in their theatre to special price for us: only 10 euros. If the number of participants is more than ten people, the theater will make a discount by paying only 10 euros each ticket instead of 15!! 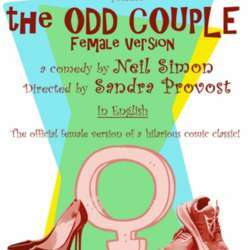 Neil Simon wrote The Odd Couple in Protected content by the amusing adventures of his brother Danny Simon and the theatrical agent Roy Gerber. The comedy was immediately successful on Broadway, followed in Protected content the successful film version directed by Gene Saks with Walter Matthau and Jack Lemmon. The Odd Couple soon became one of the most represented performances by professional and amateur theater companies all over the world. In Protected content , after having found that many companies adapted the text to women, often with little adherence to the original work, Simon decided to write the same version of himself as two women instead of two men. So the story of Oscar and Felix has become that of Olive and Florence.